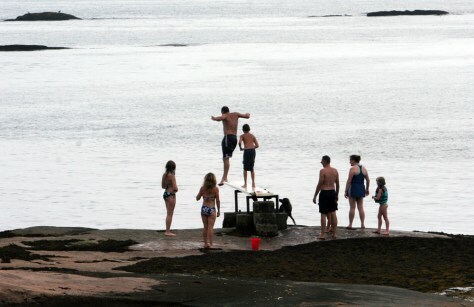 Residents of Money Island take advantage of a diving board in the Thimble Islands off the coast of Branford, Conn. The island chain, within a three-mile radius of Stony Creek, has long attracted the rich and reclusive, the famous and infamous, from President William Howard Taft to P.T. Barnum's circus star Tom Thumb to cartoonist Gary Trudeau and his wife, television journalist Jane Pauley.